Currently viewing the tag: "Canon"
I’ve started to do a bit of gearing up so I wanted to post about my emerging hobby, vlogging and podcasting. I continue to watch, like most people, the massive boom in video production and the commoditization of video creation equipment (DSLRs, HD Cameras, Editing Software, etc. ).While I’ve been thinking about this for at least the past year, the change was spurred on by the Auto Focus (AF) failure of the Canon EF-S 18-55mm f/3.5-5.6 IS Lens. We’ve had the lens for more than 5 years and its autofocus started failing. Like anything that we purchase I started to look into a replacement lens. We ended up settling on a Tamron AF 17-50mm to pair with our Canon T3i. This post serves as a round up for most of the gear I’ve collected as a podcast setup for a home studio setup. Canon EOS Rebel T3i – It is a pretty powerful package that is a couple years old and has been replaced by the Canon T4i (itself about to be replaced). We originally bought the Rebel Xsi version of this T3i Kit . From there we upgraded the T3i Body and kept the lenses. The Canon T3i does have a cropped sensor (not full frame) but for the apprentice level it more than meets my requirements. For video recording its LCD is able to rotate out and reverse in order to see the shot while recording, I find this extremely helpful. Tamron AF 17-50mm F/2.8 XR Di-II LD SP Aspherical (IF) Zoom Lens – I decided on this mainly due to the lens it was going to replace (18-55mm) and the significant improvement on the F Stop (constant 2.8 through the Lens’ range; lower is better). The Tamron AF 17-50mm is a massive improvement over the kit lens and we’re extremely happy with having selected this lens. Canon EF 50mm f/1.8 II Lens – The Canon 50mm or “Nifty 50” as it is called is an excellent portrait lens. Since it is a “prime” lens (no zoom) it is exceptionally fast and comes with a great F stop. Canon EF 75-300mm f/4-5.6 III Lens – just the kit lens from the original kit purchase. Neewer 160 LED CN-160 Dimmable Video Light – The Neewer CN-160 is an excellent option to provide a significant light boost for better lighting during video creation. The throw on this light is quite a bit and the dim feature helps afford a great dial in of light level. Canon Remote Switch RS 60 E3 – The Canon RS60 allows for a bit of remote start and stop of video without messing with the camera itself and prevents any vibration “hitting the button” might create. LensPen NLP-1 – The LensPen serves to tidy up the lenses after a bit of use. Tripod – Everyone needs a good Tripod ! Get a fairly tall one for versatility- especially if you’re a bit taller than average! So for the individuals that are leaps and bounds beyond my amateur abilities, I would love to hear what you use and recommend?! What are you looking forward to adding to your gear list? Hit me in the comments! I recently upgraded to the T3i and saw this price which is even better so I thought I’d pass it along. This is the perfect time to pick up the T3i as the next version is due out and stores are unloading them. Traditionally there is a dip in price at this time until the new version comes out and then the price comes back up to a new higher level. These price drops are based on the uncertainty in consumers minds as to the features in the upcoming new version versus the old version. Either way you save significantly on the last year’s model right now. 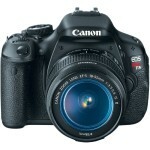 Canon EOS Rebel T3i 18MP DSLR Camera (body only) $539 with Free Shipping. Use coupon code S1234567.